Hillary Clinton has had her fair share of scandals throughout her political career, and sure, they've played a role in her presidential campaign thus far. There is plenty of room for critique when it comes to her platform and her never-ending email scandals, and yet, many people aligned with the Trump campaign still want to talk about how Clinton is unfit for the White House for reasons that go beyond politics. 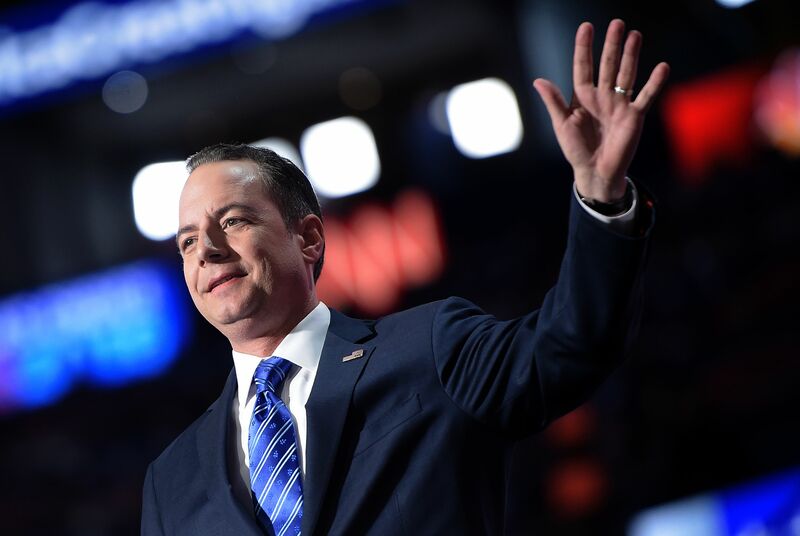 RNC Chair Reince Priebus joined the conversation on Wednesday tweeting about her lack of a smile, which had Twitter firing back with these #Smile4Reince tweets you need to see. In mid-August, the Trump campaign suggested that Clinton was fragile. Trump even said in a campaign speech how she "lacks the mental and physical stamina to take on ISIS," because rather than focusing on her actual platforms, it makes mores sense to focus on her physicality. Maybe the whole being a woman thing is part of that narrative — but then again, we wouldn't want to play the woman card on Clinton's behalf. However, if there's one thing that is so tiring as a woman, it's constantly being told to smile by men, and Priebus basically did just that on Wednesday night during NBC’s Commander-in-Chief Forum. The RNC Chair tweeted, "@HillaryClinton was angry + defensive the entire time - no smile and uncomfortable - upset that she was caught wrongly sending our secrets." Well, Twitter is responding to Priebus' tweet with the hashtag "#Smile4Reince" and it's perfect. Here are some of the funniest "Smile 4 Reince" tweets. So, yeah. Look, Priebus, I get it. You're the RNC chair, you're trying to help out your nominee Donald Trump in whatever ways you can. Your party depends on you trying to hold it together. But Clinton wasn't smiling while talking about matters of national security and veterans affairs? I mean, wasn't there anything besides her serious demeanor that you could have noted? Women don't need to be told to smile all the time. We don't want to hear it from the men in the street when we're walking to the train, or from the person in his car who wants us to give him a smile because he said "what's up." And when a woman is running for president of the United States, it's probably safe to say whether she smiles or not isn't going to be what gets her into the White House. I'm going to go ahead and assume that people aren't voting for the candidate with the best smile, but for who they trust to make the most important decisions facing the entire global population for the next four to eight years. There has to be something that is more important to note than Clinton's smile.